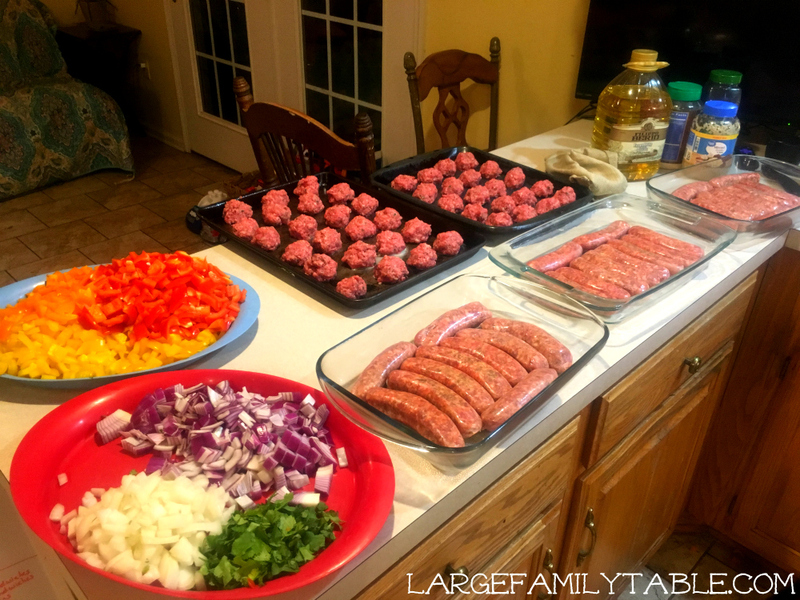 It’s no secret I love having large family freezer meals prepped and ready to go! We have a bunch of fresh fruit and veggie options for snacks. I also like to have make-ahead freezer friendly snack items available as well, like these homemade protein bites! Large Family Snacks are always a hot topic amongst moms because we love fresh ideas to keep these kids fed and happy. These homemade protein bites are also called energy bites, power bites, protein balls, and energy balls. Whatever you call these snack ideas they are healthy and protein packed. My kids come running with I’m making homemade protein bites because they know making these will be a yummy good time. I made about 12 dozen (yes, 12 dozen!) the other week and the kids were thrilled. These protein balls are freezer friendly, so I can meal prep hundreds of them to have in the freezer for snacks when they’re needed. Part of our lunch on our recent trip to Washington DC to see the cherry blossoms was a big pack of these homemade protein bites! These homemade protein bites are a no-bake recipe. This allows the kids to jump in and “help” momma whip these up fairly quickly. The 4, 6, and 8-year-olds were my special helpers this go round. They loved each mixing up their own special flavors. We made a Coco Chocolate Chip, Coconut Walnut, Cranberry Chocolate Coconut, Raisin Crasin Nut, so many variation ideas! It was very tempting to add chocolate chips to each batch of protein bites. It was also tempting to roll each protein ball in shredded coconut flakes – that’s the fun part. We resisted though and made six different flavors as you’ll see below. After we made six different energy ball variations we stuck each bowl of no-bake ingredients in the refrigerator for about an hour or so. Then we washed our hands well and went to hand rolling our homemade protein bite creations! This is where the kids had a ton of fun. They rolled the energy bites in shredded coconut here and there, too. We lined a large baking pan with parchment paper and did layer upon layer of protein bites. I stuck both pans that were loaded down with layers and layers of protein bites in the freezer to flash freezer for a few hours. It was nearing bedtime so I ended up leaving both pans full in the freezer overnight. The next morning we divided the frozen balls into baggies with about two dozen energy balls per bag. We keep these frozen bags of protein balls in the freezer until we need them. Like I do with a lot of made ahead frozen food, I just set these frozen protein bites out from the freezer into the refrigerator the night before we need them. The following day we pack them in lunches for homeschool group, field trips, or to have as a fun available snack for the day. With eight kids having protein bites for snacks that means each kiddo has about 3 “bites” each out of a two dozen pack. Make ahead big batched of no-bake homemade protein bites for healthy family snacks! These energy balls are freezer friendly and easily adaptable. Here are the base recipe ingredients you’ll need to add to every batch. This homemade protein bites recipe makes approx. two dozen energy balls. I multiply this recipe by six or 8 plus add in additional recipe ingredients below when I want to make a bunch of twelve dozen or more! For Cocoa Chocolate Bites add in 1/4 cup unsweetened cocoa powder and 1/2 cup of chocolate chips. For Cranberry Raisin Chocolate Chip Protein Bites add in 1/2 cup dried cranberries, 1/2 cup raisins, 1/2 cup chocolate chips. For Coconut Walnut Energy Bites add in 1/4 cup shredded coconut flakes, 1/2 cup of walnut pieces. For Chocolate Chip Raisin add in 1/2 cup chocolate chips and 1/2 cup raisins. For Cranberry Coconut add in 1 cup dried cranberries and 1/4 cups shredded coconut flakes. For Coconut Chocolate Chip add in 1 cup chocolate chips and 1/2 cup shredded coconut flakes. Mix the various flavors you choose in separate bowls. Chill mixes for 30 minutes to an hour. Roll mixture into small balls. Additionally, roll some protein bites into shredded coconut if you’d like. Flash freeze protein bites in the freezer for at least two hours. 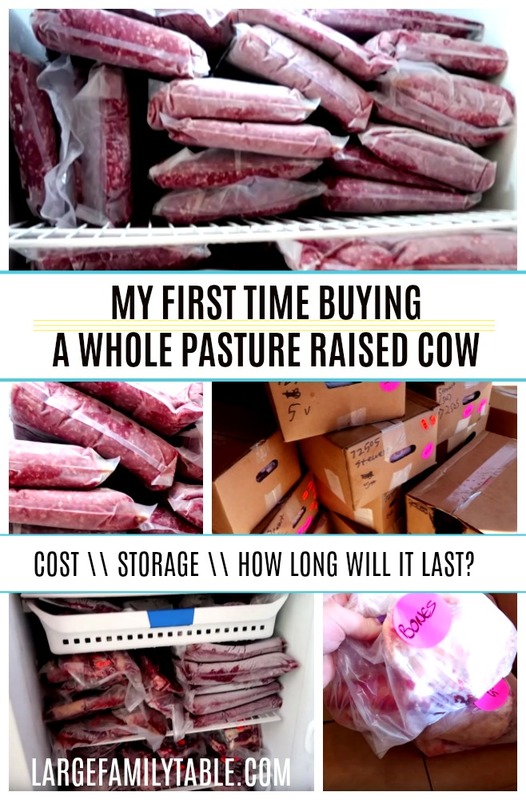 Once frozen divided into multiple freezer bags. Label and store up to three months. When you’d like to add homemade protein bites to your snack options just set a frozen bag out into the refrigerator the night before to thaw. Here on YouTube you can watch me make these homemade protein bites recipe with six different varieties! You can also watch me clean up my messy kitchen while we’re at it!! 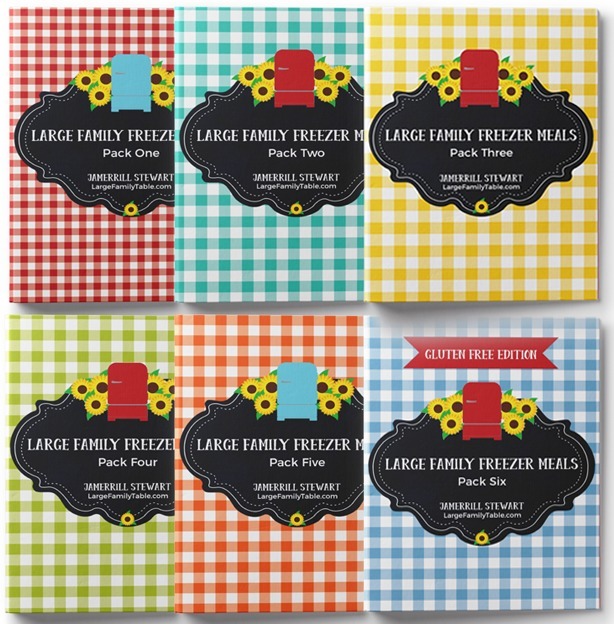 ALSO, don’t forget to grab the SUPER MEGA Large Family Food Collection here! A note from Jamerrill: Hey there! My good friend Monica has a family of six. She has also been a foster mom to many and done home daycare over the years. Meaning, Monica feeds lots of kiddos. She has been dairy-free for a few decades and has a life-threatening tree nut allergy. Here on Large Family Table, Monica will now share with you her allergy diet wisdom, tips, and tricks she had learned over the years! For all of you large family moms who need to make dairy-free meals, we’ve got you covered! Here you will find a list of 45+ dairy- free slow cooker, freezer, instant pot and oven meals to feed your crowd. Cooking dairy-free dinners can be a challenge. Many of the basic casseroles and meals that are large family friendly include cheese as a main ingredient, which can be frustrating. It was a complete learning curve for me to learn how to cook with flavors instead of relying on cheese as a flavor. I found that international food was a great way to go as many other cultures do not eat as much dairy as our American diets include. Plus it tastes great! Other than that, I had to learn how to substitute dairy items in recipes. (More to come on that soon!) For now, I have compiled this delicious list of dairy-free meals to get you started. I have recently added an Instant Pot to my kitchen and I can’t begin to say how much I love it! It’s easy and the flavors infuse so much better in my opinion. Of course, I still use my slow cooker, too, and the beautiful thing about many of these recipes is that that can be made both ways. Are you in the mood for something Korean? Here’s an Instant Pot Korean Beef meal that only takes five minutes to put together! This tasty and versatile Rosemary Garlic Chicken can be placed in freezer bags for later, cooked in the slow cooker, or made in the instant pot. Your family will love this one as much as you do. Trying to keep on Keto or Trim Healthy Mama? Try this Large Family Keto Instant Pot Beef Stew. You’ll stay on your plan and the family will love the taste. If you’re tired of the usual roast beef, then try this Large Family Italian Peppered Beef Roast for the Instant Pot, Crockpot or Freezer. This Coconut Lime Chicken is the perfect balance of refreshing and sweet. Not sure what to make with that pork roast? Here’s a Zesty Italian Pork Roast that’s also freezer friendly. 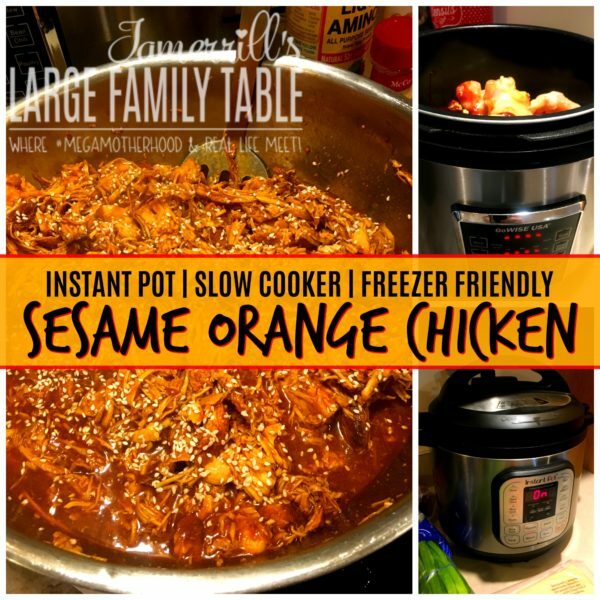 Try something Asian inspired with this Sesame Orange Chicken. 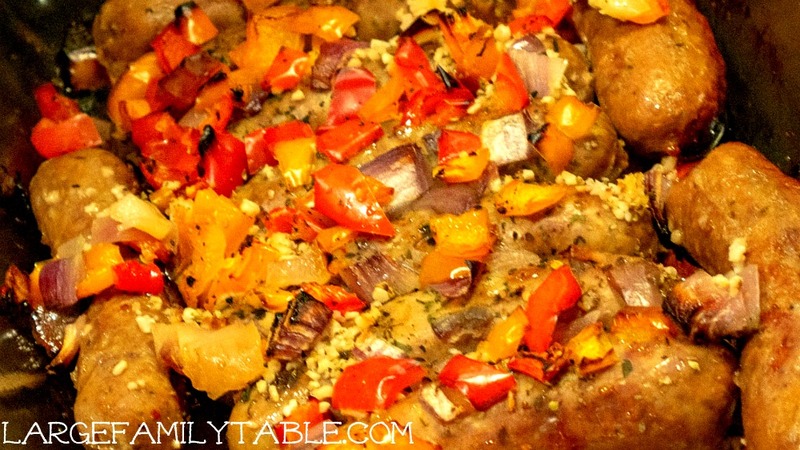 These large family sized Pork Chops are simple and tasty. They can be made in the slow cooker or Instant Pot. This portion of the list if for the dairy-free slow cooker meals, however, if you are handy with the Instant Pot you can convert them. You’ll also notice that some of these are already designed for the freezer, too. Here is a Slow Cooker Meatloaf that includes the option of adding veggies to round out the meal. You can make this Taco Meat recipe to suit everyone in your family. You supply the toppings to add and they get to make it their way. This is a nice option if you have people in your family who still can eat cheese because you can include that as a topping, too. This Chicken Teriyaki is a family favorite in our house! Beef Ragu is the perfect pasts dish for a busy night. Freeze or make this Beef and Broccoli in the slow cooker. Either way, you’ll love it. Who doesn’t love Sloppy Joes? They’re kid friendly and great for parents, too. Want to save some money but keep the taste? Make these Crockpot Beans and Rice, they’re cheap and tasty! This Turkey Chili Recipe is delicious, just replace the dairy toppings with toppings of your choice or enjoy it without toppings. I like to add potatoes to this Ham and Beans meal and that rounds it out nicely. Leave out the butter or replace it with olive oil in this Steak Roast and Brown Rice recipe. Here’s a Cabbage Soup recipe that is adaptable to Trim Healthy Mama. Be sure to leave out the butter or replace it with olive oil. Try this yummy Chicken and Sweet Potato Stew for a great flavor and a hearty meal. You’ll love these Chicken Fajitas! Just throw them in the slow cooker in the morning and enjoy them at dinner time. I love that this Slow Cooker Sausage and Spinach Soup Freezer Meal can be made immediately or put in the freezer for later. Looking for a pop of flavor? Make this Thai Pineapple Vegetarian Curry . You will love these flavors and it takes so little work, too. 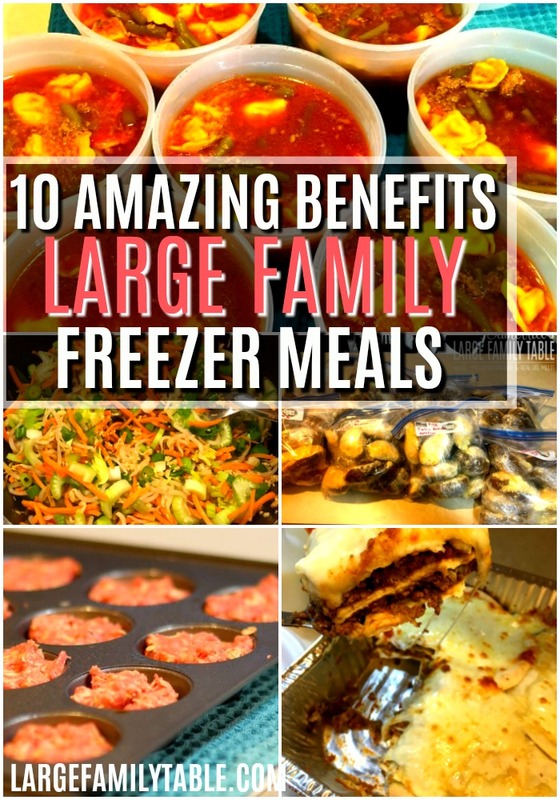 If you are a freezer cooking mama, this list is going to make you happy! Wheather you make freezer meals to save your mama sainty or you have an impending big event coming (having a baby? traveling?) this list will get you set! Your children will love this Chicken Fried Rice. It’s a great place to start to introduce international food for the first time. You’ll enjoy the flavor combinations of this Sausage and Spinach Fried Rice. There’s nothing fancy in this Garlic Lemon Chicken, but it still tastes great! It’s easy to make a batch for the freezer and keep on hand for those busy days. 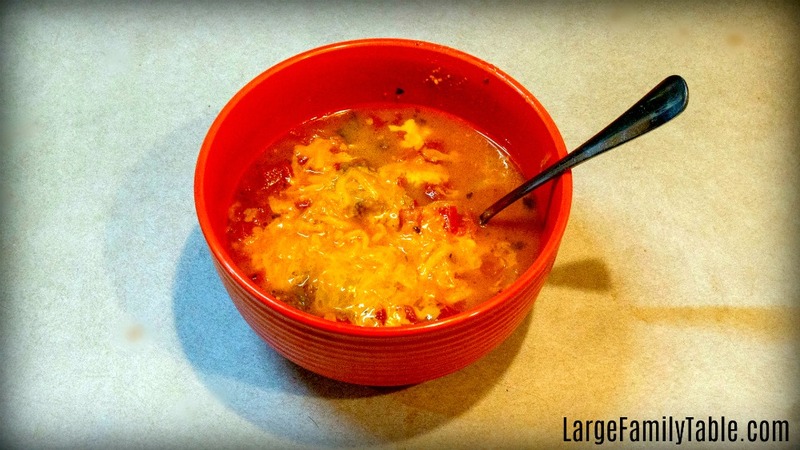 Here is a Vegetable Beef Soup that’s easy to throw together and stockpile in the freezer. Don’t be afraid to try making these Baked Egg Rolls just because you’ve never used a few of the ingredients. They’re simple to make and you can tweak them to suit your likes. If you love the flavor of curry, then try this Chicken Cauliflower Curry. This recipe makes two freezer meals for a large family so you can enjoy this meal twice as much! 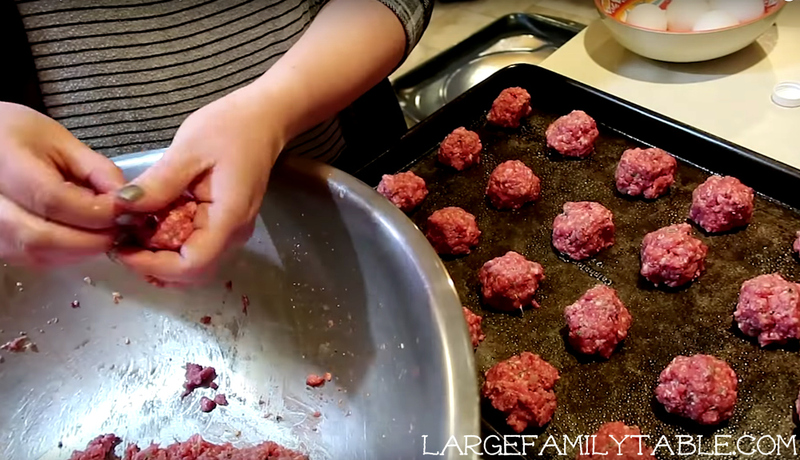 These Low Carb Turkey Meatballs are the perfect choice if you are on the Trim Healthy Mama plan. Plus they’re so good, too. This Mexican Quinoa is a tasty meal. I like to serve salsa and chips and fresh fruit on the side to make this meal stretch for a large family. Our final list is ready for the oven or stove top. These dairy-free meals are still fast options, so don’t worry about that! You just make them a different way. This Puerto Rican Rice and Beans are delicious and serve 6. Of course, you can double it to feed more. Here are Salmon Cakes and Oven Roasted Red Potatoes. I like to include fish of some kind on a regular basis. This Chicken and Broccoli Stir Fry can be adjusted to suit any family size! Just apply the numbers you need into the drop-down menu. Here’s an easy Oven Fried Chicken with Corn Flake Coating meal for those nights when you are craving comfort food. This Lemon Chicken Orzo is fairly easy to make and a great dish. Just add fruit or a salad and rolls, and its large family sized. 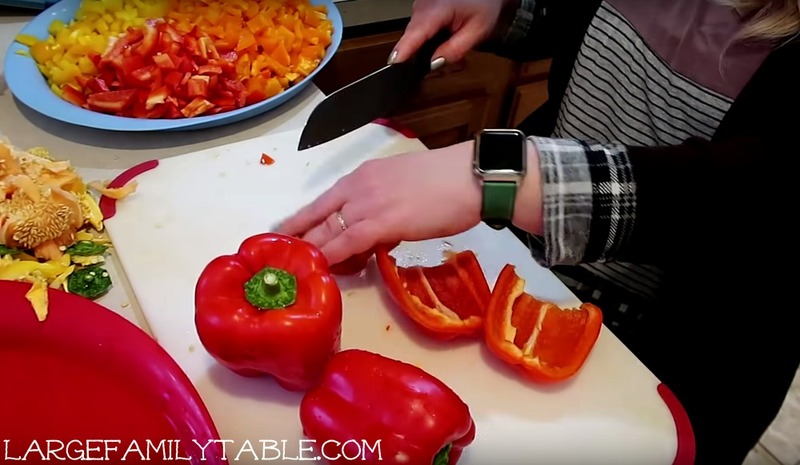 Double this Stuffed Bell Peppers meal and leave off the cheese topping to serve a large dairy-free family. Here is a Korean Fried Beef that will be a favorite if you like Asian inspired meals. Simple Chicken Broth Bowl is easy to make, but you will need to double this to feed a large family. This Grilled Southwestern Steak Salad is perfect on summer evenings for a cook-out style dinner. Add sides like fresh watermelon, rolls or s’mores to make it stretch. Double this Vegetable and Egg Fried Rice meal to make it a large family sized meal. Don’t want to clean up a mess? Try these Foil Packet Burgers and keep dinner mess free. Of course, you can leave off the cheese to keep them dairy-free. Here is Mini Meatloaves. Don’t be fooled by the name though, they’re taste is not so mini. Replace the butter with oil in this Brunswick Stew with Chicken and Pork. Double this Maple Glazed Pork Chop recipe to make it large family sized. Talk about flavor! This Beauford Stew is going to be all your family talks about if they love the flavor. 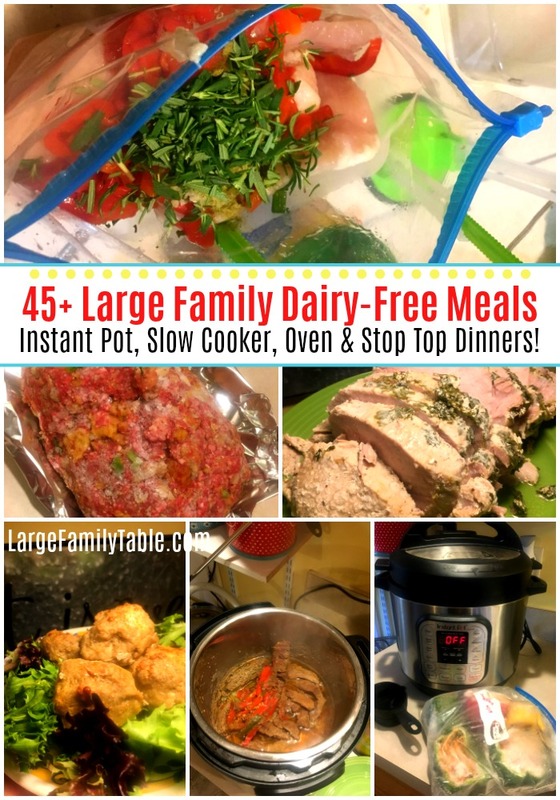 Before you go, be sure to check out 50 Keto Instant Pot Large Family Freezer Meals! Or if you are gluten free try our round up of 75+ Gluten Free Recipes. As time allows I love to mix in easy fresh meals to feed my large family. Freezer Meals are my favorite, and Sheet Pan dinners also press the fairly easy button for me, too. 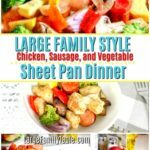 When I’m able I love to pull together an easy dinner like this large family chicken, sausage, and vegetable sheet pan dinner recipe! 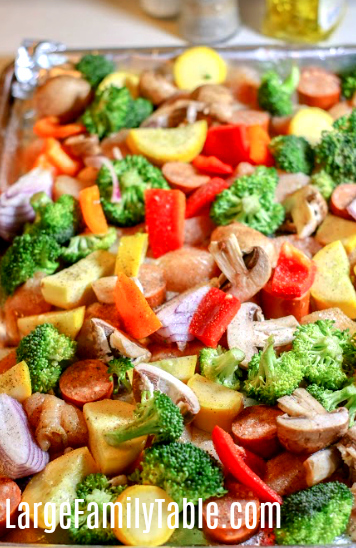 For this large family sheet pan dinner recipe you can use frozen broccoli or fresh. Squash is usually available, although priced nice in the summer. You can also change things up a bit by adding Zucchini, Asparagus, Carrots, Brussel sprouts, potatoes, or more or fewer peppers. You can also make this an even cheaper large family recipe by adding more vegetables, and decreasing the amount of meat as your budget and pantry allow. 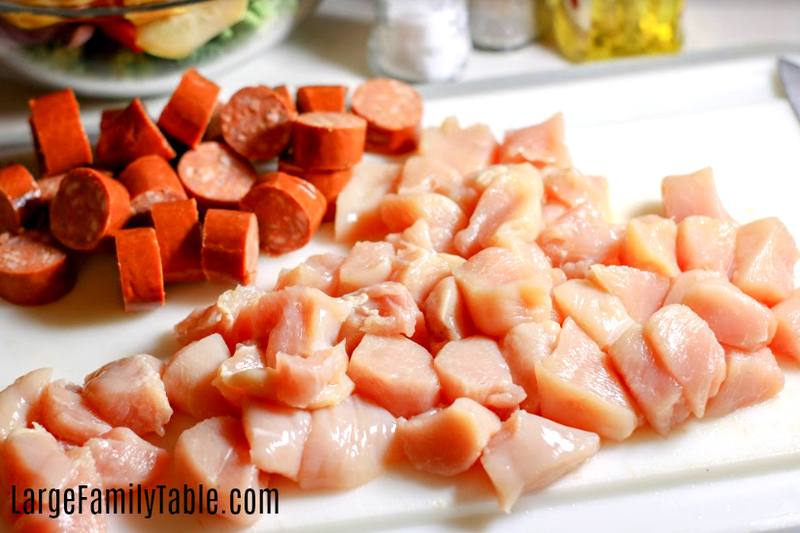 When making this large family sheet pan recipe I use up to 4 lbs of chicken and two packs of Cajun sausage. This will allow our family of ten to have a healthy, hearty dinner, with some additional leftovers. You know I love leftovers! The Cajun sausage adds some heat and kick to the recipe. I love a little spice. However you can use a milder sausage or even Kieblasa as a replacement. 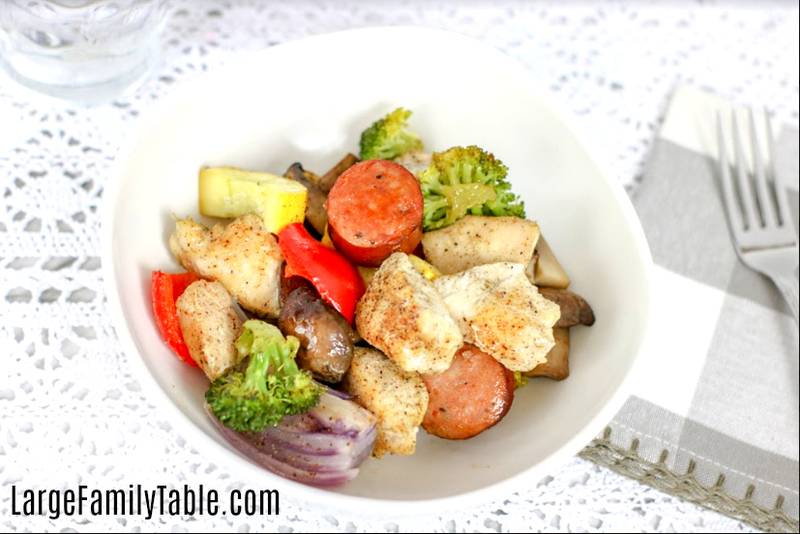 I use two large rimmed baking sheets to cook up this Chicken, Sausage, and Vegetable Sheet Pan Dinner. You can line your pans with foil for quick clean up. To save time, I put both pans in at the same time and I rotate my baking pans in the middle of the cooking cycle. 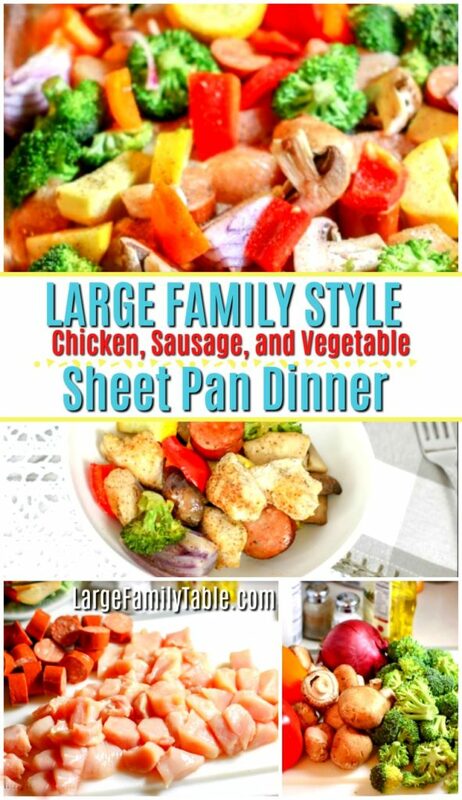 Enjoy this large family style sheet pan dinner! Chicken, Sausage, and lots of veggies make this delightfully healthy family dinner and *may* leave you with a few leftovers for the next day as well. I personally used two large sheet pans, rotating the sheet pans in my oven about halfway through the bake time to cook evenly. 1. Preheat oven to 425 degrees. Prepare two rimmed baking sheets with aluminum foil (for easier cleanup) spritzed with non-stick cooking spray. 2. In a mixing bowl, stir together the dry seasonings. Divide the seasoning and sprinkle the cubed chicken with half of the seasoning. Place on the chicken baking sheet, spacing evenly. 4. 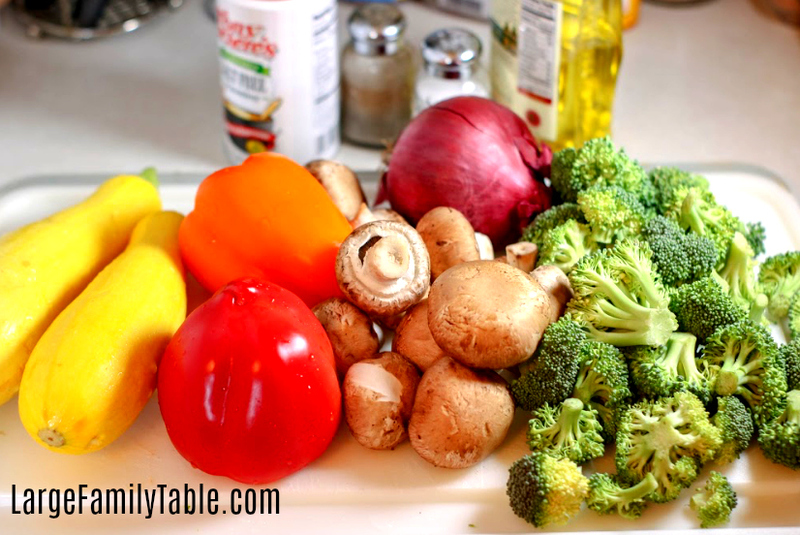 Add the vegetables to a large bowl and drizzle with olive oil. 5. Add the sausage and vegetables around the chicken. Sprinkle the remaining seasoning blend over everything on the sheet pan. 5. Bake for 20 to 25 minutes, turning chicken and vegetables halfway, or until chicken is cooked through. 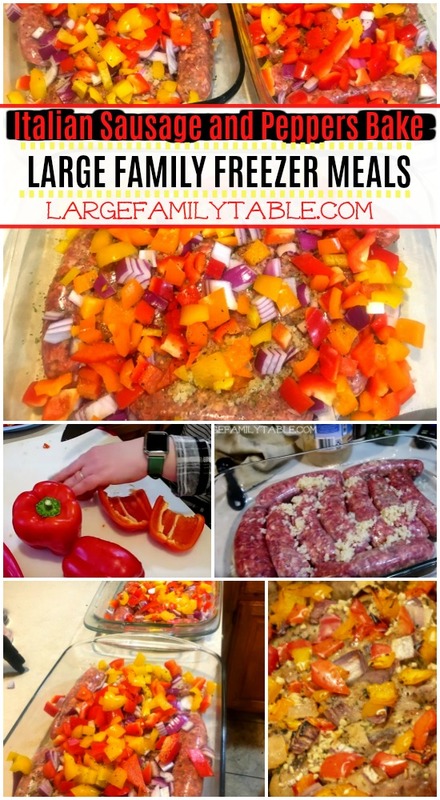 I hope you enjoyed my new large family sheet pan dinner recipe. I have more of these planned to share in the coming months. 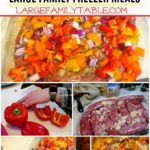 Here are more large family recipes! Don’t forget to get the FREE Large Family Food collection if you haven’t already. 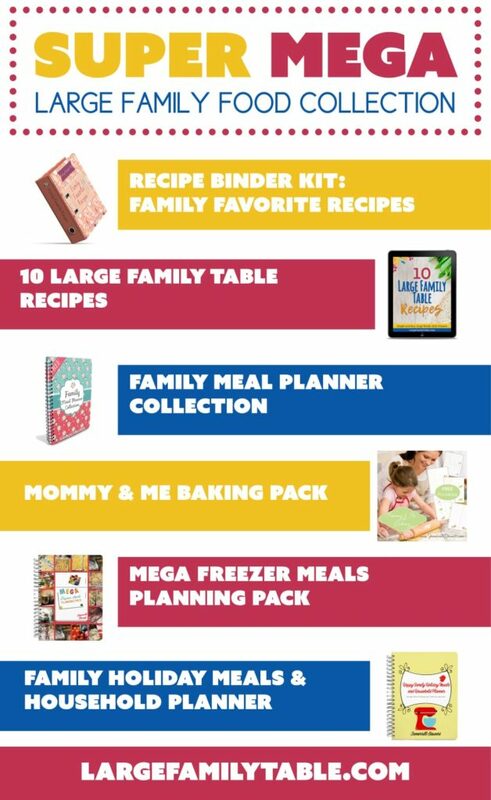 It includes family meal planners, freezer cooking pages, and more! Making up a big batch of freezer meals to keep my freezers full is so helpful for all of the real life going on. The other week I was able to prep ahead 20 Healthy Freezer Meals for my family for the coming weeks. This was right on the tail of making 40 Freezer Meals for New Moms that I cooked up for several new momma friends. You know I love to get in a good large family freezer cooking day when I can. Some months I can get in freezer cooking multiple days and other times I may go months without making freezer meals. That’s okay though because it’s during those non-freezer cooking months that we eat down what I have stashed in our freezers. 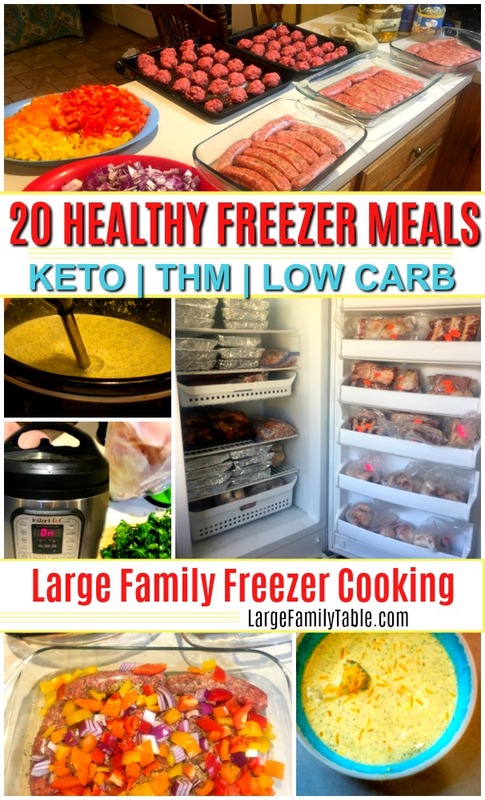 These 20 healthy freezer meals are gluten-free, sugar-free, Keto, low carb, and Trim Healthy Mama S-Meal friendly. Several of these healthy freezer meals are even dairy free! How Much Did These Freezer Meals Cost? It cost me right around $179 for all the groceries I needed to make these 20 Healthy Freezer Meals. That breaks down to a little over $8 per meal. I needed most of the ingredients for these freezer meals. I did have ground beef, but I needed to buy chicken and pork sausages. Your grocery prices may vary by location. You might even have more of the needed items on hand! Here is my once-a-month large family grocery haul which also showed the items I purchased for this freezer cooking day. I’m well known for NOT being an expert in too much of anything other than clinging to Jesus and encouraging lots of momma sanity helps. If you are gluten-free or need to make gluten-free freezer meals for others be sure to check the packaging well. I’ve heard from many mommas who are experts in gluten-free meals that gluten is included in many food items, sometimes even shredded cheese, sigh. 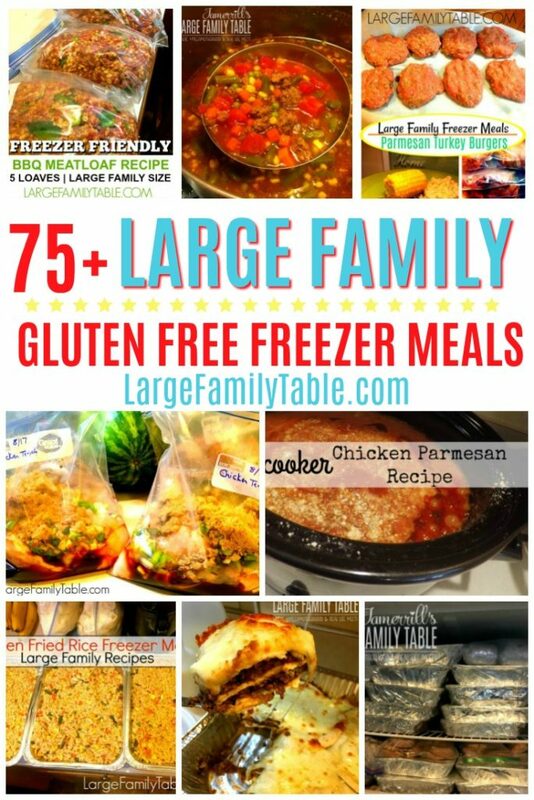 You might be interested in large family freezer meals pack six which features gluten free freezer meals or these 75+ Gluten-Free Freezer Meal Recipes. I had some adventures on my 20 Healthy Freezer Meals cooking day. The main adventure was one day turned into two. Now, of course, I didn’t do a bunch of freezer cooking for 48 hours straight. The first freezer cooking day consisted of several hours where I batch cooked the last of my pasture raised ground beef and freezer meal prepped tons of veggies. I also cooked a pasture-raised hen in my 14 Qt pressure cooker to make the homemade chicken broth I needed. Additionally, I made 5 dozen Keto meatballs, three Low Carb Italian Sausage and Peppers Bakes, and two Low Carb Beef & Cheddar Cauliflower Bakes. Within that time my hubby and kids got back home from piano, Walmart, post office, errands. The kids needed dinner and of course decided that was the night for long, deep conversations, ha! At some point, I laid down with the baby to nurse him to sleep and felt myself drifting off as well. This is where having helpful teens is OH SO HELPFUL! I asked my 15 year old to save me life :). He packed up what I had out in the kitchen and did my freezer cooking dishes. Yes and amen, thank you, son. The next day after morning homeschooling was done and the kids were pretty occupied playing with baskets of stuffed animals on the deck I dove into finishing up the rest of the Instant Pot and Slow Cooker Freezer Meals. In under two hours (because so much was done and prepped on the first day), I made 15 Healthy Instant Pot Freezer Meals. Those 15 plus the five low carb freezer meals for the oven I had made the day before brought me to the total of 20 Healthy Freezer Meals, hurrah! 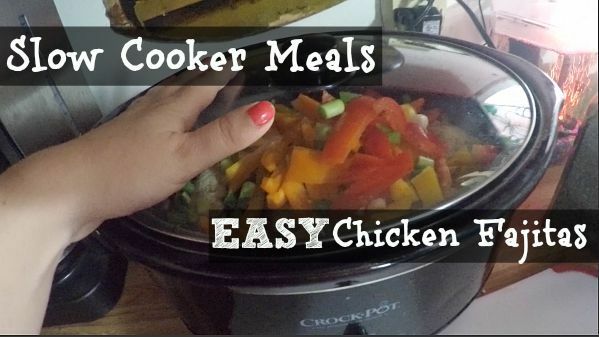 Here are the healthy freezer meal recipes I used to make my 20 freezer meals this go round! 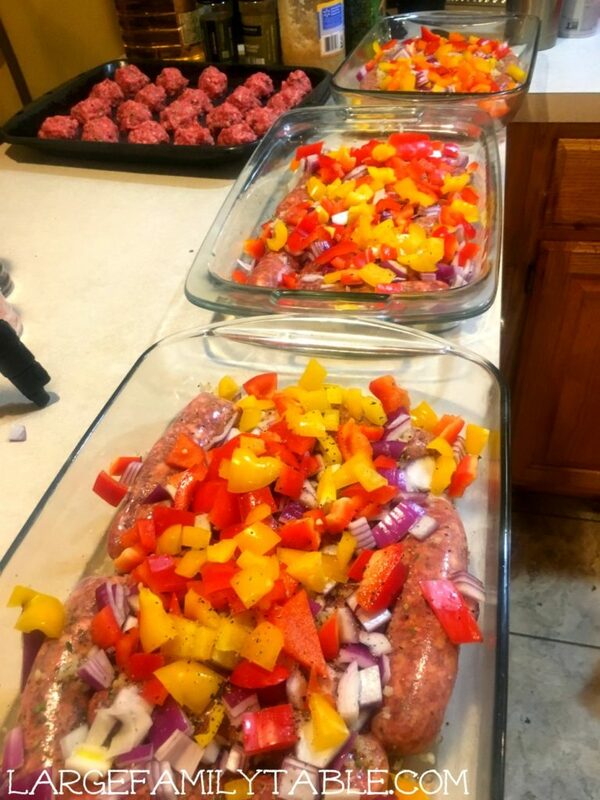 Italian Sausage and Peppers Bake I made two 9×13 pans. This is also a dairy-free freezer meal! Keto Red Pepper Meatballs over Cauliflower Rice Read about how I LOST over two dozen meatballs, ha! I only made 1-gallon freezer meal bag of this recipe. Peppered Lemon Chicken – I made several bags of Peppered Lemon Chicken. It’s great so many ways! This is a dairy-free freezer meal. 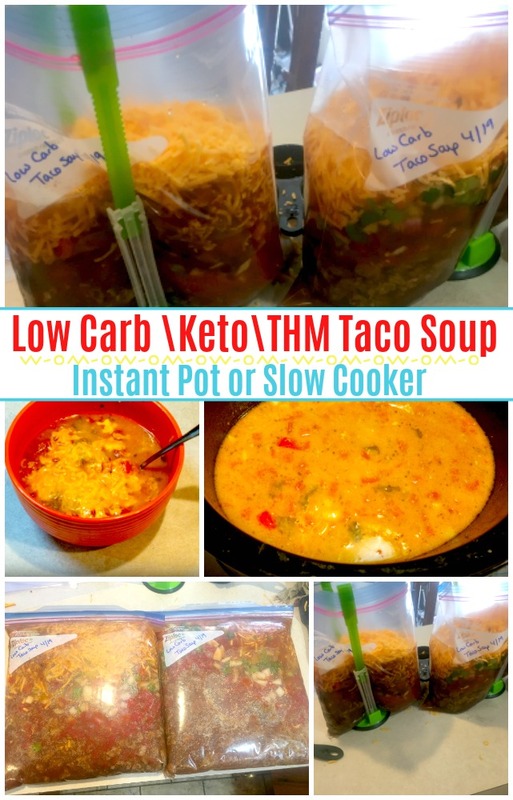 Low Carb Taco Soup – These bags of Taco Soup are low carb and amazing! Low Carb Broccoli Cheddar Soup – hello immersion blender! Low Carb Cheesy Cauliflower Soup – Using the immersion blender helps this soup really come together during cooking. Lime & Cilantro Chicken – Several freezer meals were made of this Lime & Cilantro Chicken. This is another dairy-free freezer meal! You can watch me make these 20 Healthy Freezer Meals in this massive YouTube video that I just released! See my grand plans that turn into two day plans and all the real life momma fun and adapting that goes into pulling it all off and making it work out in the end! Do you need help getting dinner on the table and having a bit of kitchen sanity? Wouldn’t it be wonderful to have many freezer meals prepped and ready to go to feed your family fast, quick, and in a hurry? 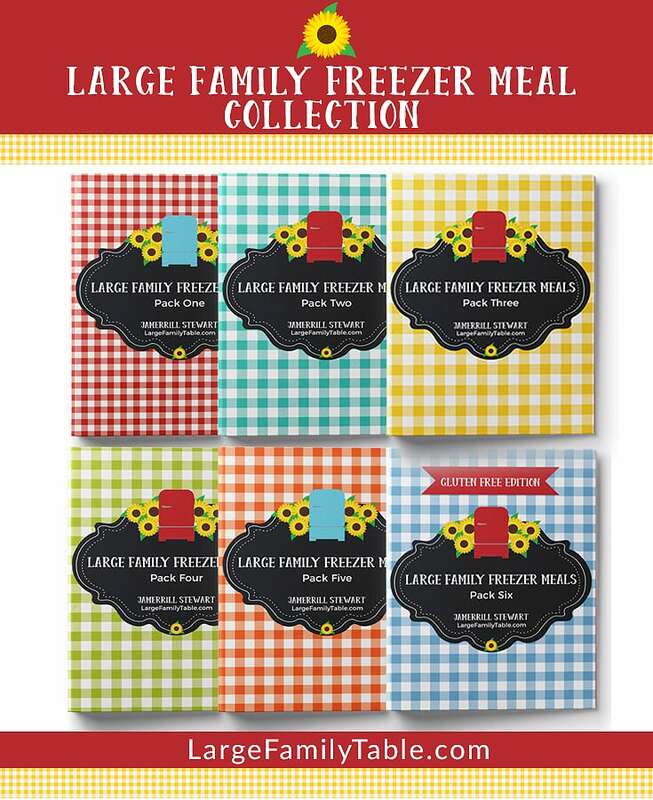 Here’s my Large Family Freezer Meal Collection to save your momma life, big time!! You might also enjoy these additional healthy freezer meal recipes! Here’s my last Gluten-Free Freezer Cooking Day where I made 30 meals! The BEST Freezer Cooking Methods to Fill Your Freezer Fast! 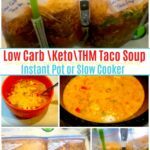 Low Carb Taco Soup for the Instant Pot or Slow Cooker, Keto, THM too! 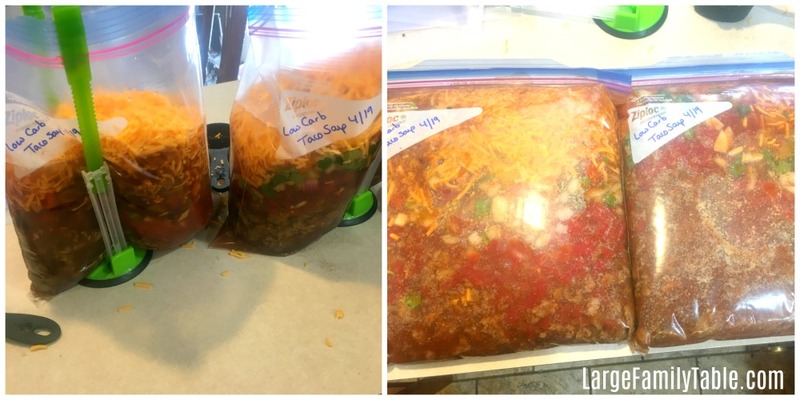 The other week when I made 20 Healthy Freezer Meals I made up two batches of Low Carb Taco Soup for the Instant Pot or Slow Cooker! 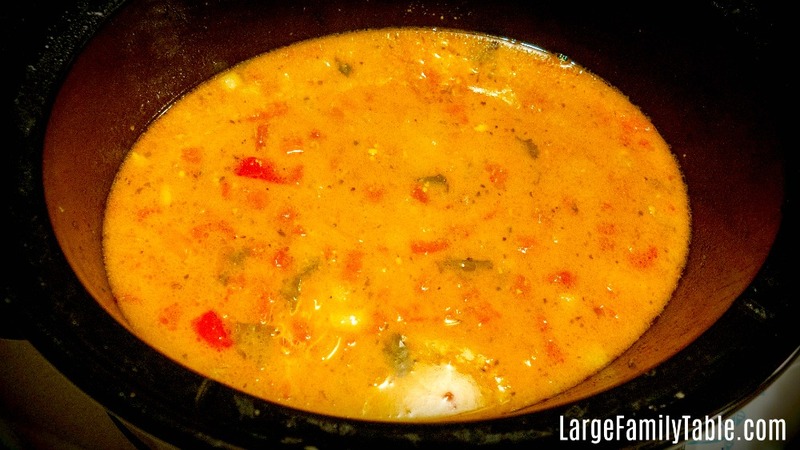 This recipe gives you the warmth and flavor of family favorite tacos in a soup. You can top with sour cream, shredded cheese, green onions, olives, peppers, salsa – any of your taco favorite flavors! Kids also love this soup because they can add corn chips as a topping, too! Cooking up some corn in the cob on the stove top or electric pressure cooker are also kid-friendly side dish ideas. Enjoy your favorite taco flavors in this warming low carb Taco Soup for the Instant Pot or Slow Cooker. Add your top pick toppings such as sour cream, shredded cheese, green onions, olives, peppers, and more! Divide ingredients evenly between two labeled one-gallon freezer bags. Place in the freezer for up to 3 months. When you’ve like to make this meal just thaw it in the refrigerator the night before. On cooking day dump contents of the bag in the Instant Pot or Slow cooker. For Instant Pot cook soup on manual high for 20 minutes. 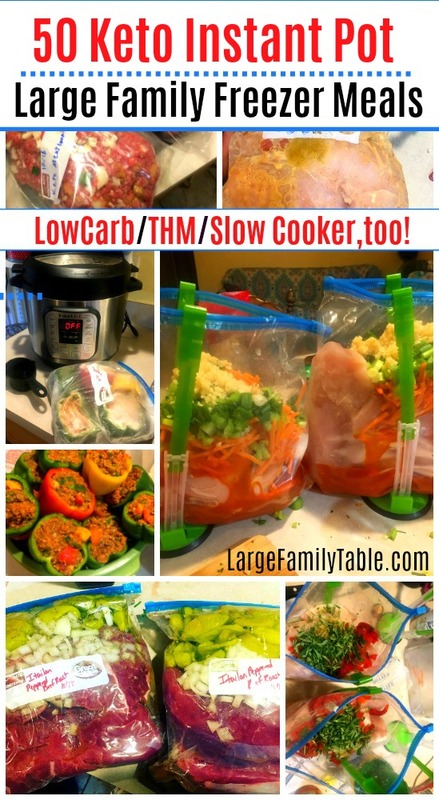 For the Slow Cooker cook on high up to 3 hours, or low 4-5 hours. Serve with your family’s favorite toppings! 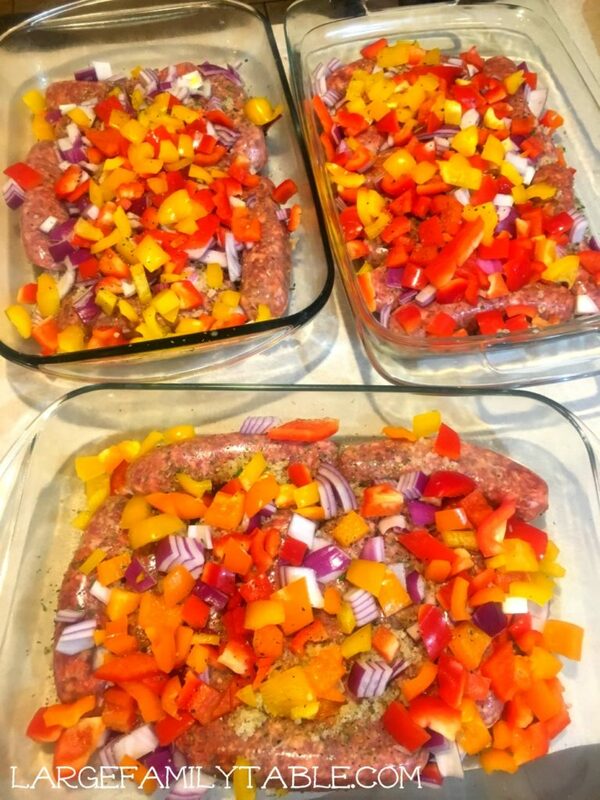 Watch me make this Italian Sausage and Peppers bake in the new 20 Healthy Freezer Mealspost with video link and more new healthy freezer meal recipes!